ProForm Chimney RestorationTM is a non-destructive chimney lining system which conforms to any shape, size or length chimney. ProForm Chimney RestorationTM is a corrosion-proof, flame and heat resistant, airtight liner tube made of a composite material with the rigidity of steel, without seams and a fraction of the weight. (i) Interlocking tube-shaped sleeve for installation purpose only- will be removed after steam curing. (iii) Exterior Fiber- This layer made from special fabric non-elastic outer layer to prevent physical abuse. 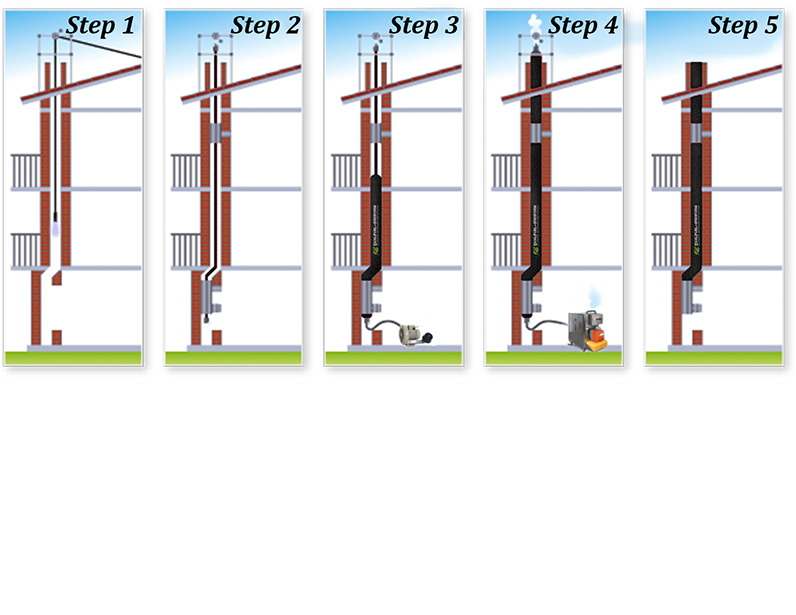 ProForm chimney liners are be installed in masonry chimneys used to vent gas or oil fired appliances only. The liners are manufactured in sizes of 3 in. to 40 in. outside diameters. The chimney liners are intended for installation in masonry chimneys having a minimum height of 25 ft. and a maximum height of 350 ft.
A prepreg (from pre-impregnated) is fibreglass impregnated with resin. The resin is pre-dried, but not hardened, so that when it is heated, it flows, sticks, and is completely immersed. Prepregs are thus fibreglass strengthened by an adhesive layer (similar to FR4 material). 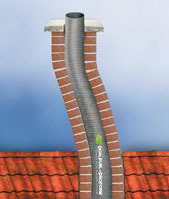 The main area of application of the ProForm Chimney RestorationTM is the lining of existing and new chimneys. 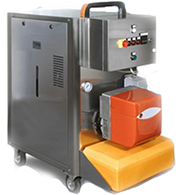 It is UL approved to be used with gas and oil heated boilers. It can be used with all types of boiler as well as with chimneys of all sizes and shapes. Its rigidity characteristics enable it to be used for the construction of freestanding chimneys as well. The intermediate composite layer is the heat, flame and corrosion resistant structural material of the DualFuel ProForm chimney liner tube. Composite means resin of high solidity reinforced with thin glass fibers. The resin surrounds and embeds the glass fibers, cementing them to each other. The resin transfers forces from one glass fiber to another and protects the glass fibers from corrosion. The solidity of composite materials is determined by the amount, type and direction of the thinner-than-hair reinforcing fibers. 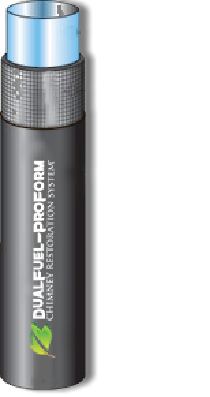 One square meter of the 2-mm thick wall structure of the DualFuel ProForm liner tube contains 3,000,000 meters of glass fiber. The external layer is a thin fabric woven from synthetic fiber. Its function is to protect the composite layer and to ensure the exact perimeter of the chimney tube. Its other function is to form a homogeneous external surface. temperatures than solid fuels such as wood or coal. How thick is the ProForm material as compared to 10 gauge stainless steel. 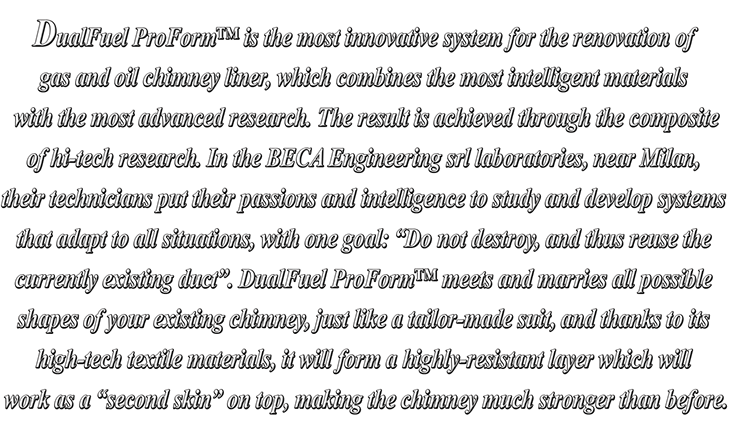 What does the ProForm Chimney Restoration system do that spray on liners can not? It offers a consistent wall thickness, no mixing involved, and will pass over an open hole in the flue. How does the cost of ProForm Chimney Restoration system compare to traditional stainless Steel. installed in a day, it does not require the demolition of interior walls and can be used in chimneys of all sizes and shapes. The longer the chimney and more the difficult the job, the cheaper it is to install ProForm Chimney Liners. 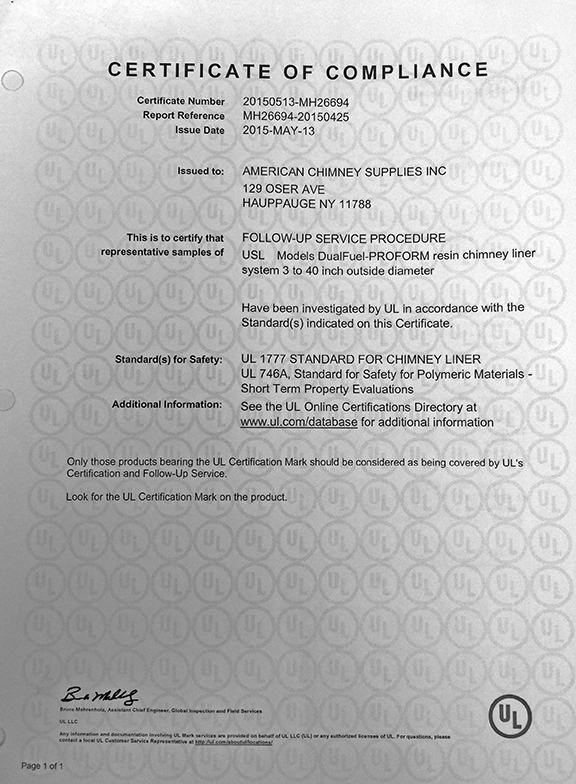 How can I become certified to sell and install the ProForm Chimney Restoration system? The process starts with sending us a message expressing your interest, we will then send you an application. Once approved, you will take the mandatory training course and purchase the required machines and tools. You are now ready to sell this revolutionary lining system. Can I do the Installation without "buying" a ProForm Chimney Restoration system dealership? Restoration liners will only be sold to certified dealers. 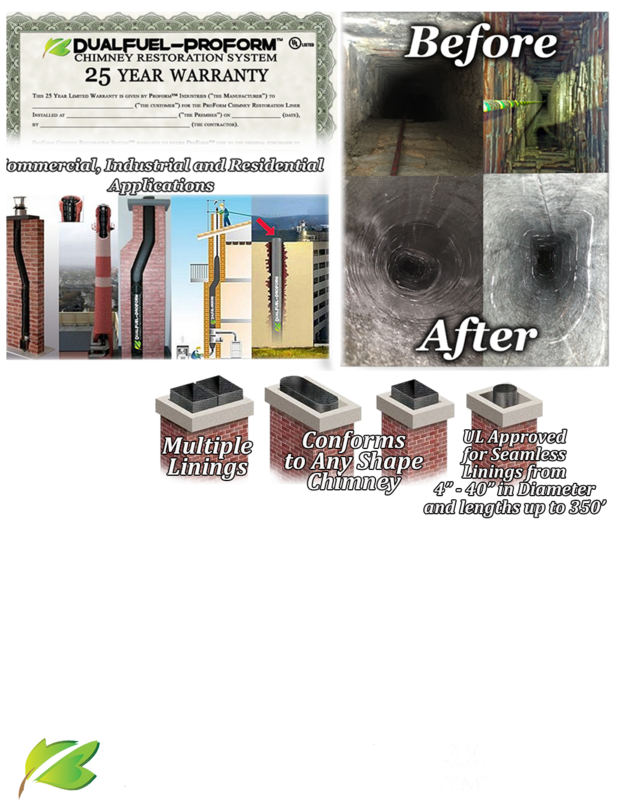 Does ProForm Chimney Restoration system provide any advertisement/promotion for the product? Will ProForm Chimney Restoration be another 'Saturated" dealership? What is the approx. lead time from order to delivery? Current lead time is approximately two weeks, but will decrease as demand increases. How does ProForm compare in weight to 20 gauge rigid stainless steel. pipe squished into a 4' x 2' slab of steel. What if I have a job that is not within my dealer territory? If there is no dealer available and it approved by ProForm Chimney Restoration you are good to go. Am I able to do my own advertisement/ Promotions for my ProForm Dealership? Yes, as long as your advertisement does not encroach on another dealer's territory.